Six things he’s done to turn it into a weak arm of Trump’s White House. No one has done more to diminish the deliberative character of the chamber than Mitch McConnell. He has invariably put partisanship—and service to the money that maintains his party’s current dominance—ahead of any duty he might feel to uphold democracy. And as the Senate’s majority leader, he is uniquely positioned to render it so dysfunctional as to be nothing window dressing for the White House. And he has done just that. The greatest responsibility of the Senate is to serve as a check and a balance on the presidency. In times of war and peace, the exercise of its constitutionally defined separate power allows the Senate to temper the imperial presidency and to guard against executive tyranny. Yet McConnell has made the Senate a part of Donald Trump’s presidential machine. Nowhere is that more evident than in his manipulation of the nomination of Brett Kavanaugh to serve on the Supreme Court. Whatever Americans may think of Kavanaugh, they must recognize that McConnell has replaced “advice and consent” with a rubber stamp. Consideration of this nomination has been engineered with an eye toward following a political calendar that is of far greater concern to the majority leader than is the good name of the Senate—let alone the Constitution. The greatest deliberative body in the world is not deliberating about the Kavanaugh nomination. It is serving as a rubber stamp. “The President and Mitch McConnell want to ram through this nomination come hell or high water, without real advice or informed consent by the Senate, but that’s just not how our Constitution works,” warns Senator Jeff Merkley (D-OR). Failed to demand the release of documents produced during Kavanaugh’s time as a political and legal operative—working closely with Karl Rove—in George W. Bush’s White House. These documents are essential to any review of this nominee, since Kavanaugh’s job involved manipulation of the character of the federal courts through the nomination and confirmation processes. “Through obstruction, and concealment of tens of thousands of relevant records, the President and Senate leadership are preventing Senator Merkley and his Senate colleagues from exercising their constitutional obligation to provide advice and consent on the fitness of the nominee,” says Kristen Clarke, the president and executive director of the Lawyers’ Committee for Civil Rights Under Law. Failed to conduct a serious inquiry into credible evidence that Kavanaugh lied to the Judiciary Committee. The senior member of the Senate, Vermont Democrat Patrick Leahy, has detailed lies Kavanaugh told the committee regarding his use of stolen documents to manipulate the confirmation process for Bush’s judicial nominees. Former Judiciary Committee member Russ Feingold (D-WI) argues that: “Taking all his testimony together, we see a clear pattern emerge: Brett Kavanaugh has never appeared under oath before the U.S. Senate without lying.” Kavanaugh’s college roommate, said after the nominee testified last Thursday that he had not been a heavy drinker (as part of a broader effort to counter allegations of sexual abuse), that Kavanaugh had lied under oath. “Not only did I know he wasn’t telling the truth, I knew that he knew he wasn’t telling the truth,” explained James Roche. Yet, McConnell has made no effort to examine the question of whether Kavanaugh deliberately deceived individual senators and the body as a whole. Failed to demand a full FBI inquiry into charges against Kavanaugh. McConnell and Glassley, in collaboration with the Trump White House, were dragged unwillingly into accepting a final FBI review of sexual-abuse allegations involving Kavanaugh. They sought to limit the scope of the inquiry and got what they wanted: a background investigation finished in just five days that failed to interview key figures in the case. “The White House confirmation that it will not allow the FBI to interview Dr. Blasey Ford, Judge Kavanaugh or witnesses identified by Deborah Ramirez raises serious concerns that this is not a credible investigation,” noted California Senator Dianne Feinstein, the ranking Democrat on the Judiciary Committee. The White House says it took its direction from Senate leaders. McConnell and Grassley made no effort to demand the honest investigation that was needed to provide senators with basic information that it necessary to confirm or reject Kavanaugh. Failed to make the FBI report available for full and easy review by members of the Senate and the American people. Though the FBI report was inadequate, or perhaps because it was in inadequate, McConnell set bizarre rule regarding its review. CNN explains that “This FBI’s work is not public. It will likely never be public. There will be no summary. There will be no release. There are 109 people who have clearance to access what was delivered to Capitol Hill at 2:30 Thursday morning—100 senators, four majority committee staffers and four minority committee staffers, one committee clerk. That’s it.” The secrecy that McConnell has imposed only reinforces the sense that the Senate leader recognizes one duty: preventing honest scrutiny of the president’s Supreme Court nominee. 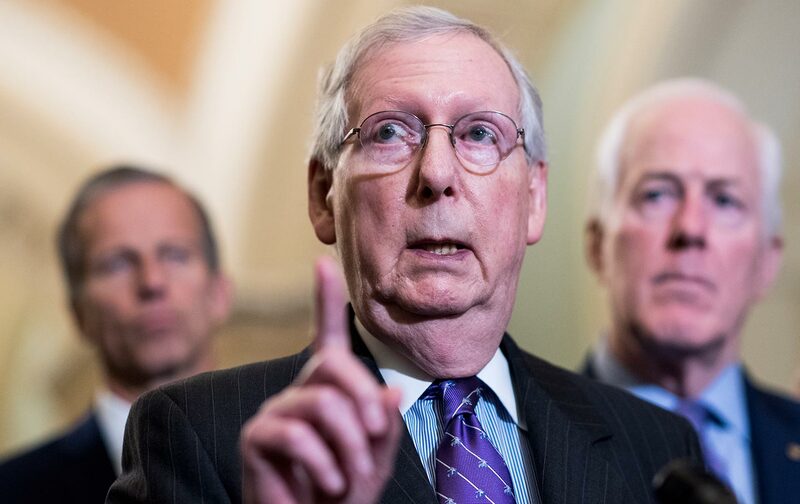 Unless the abuses that are now taking place are rejected and reversed, it will be recalled as the time when Mitch McConnell killed the Senate.